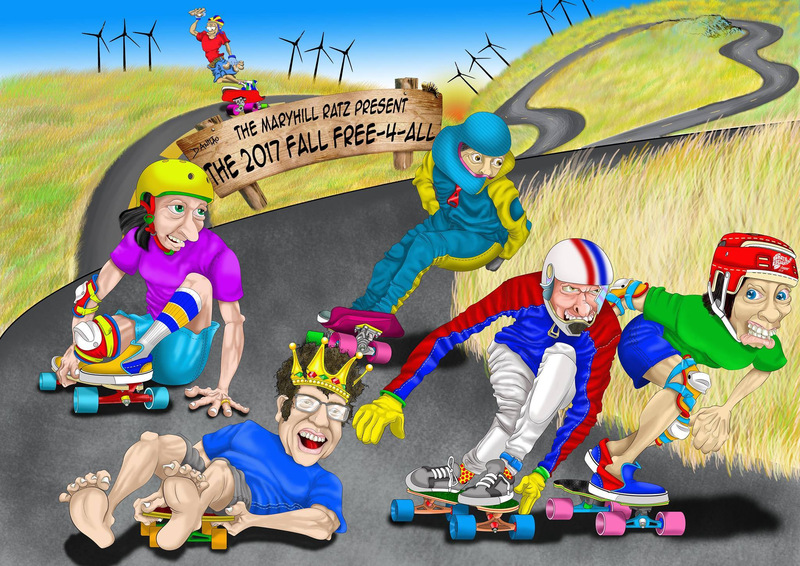 When old man Winter is just around the corner, it is time for the last freeride of 2017, the Fall Free-4-All at the Historic Maryhill Loops Road. This is just gathering of friends and world class athletes for a weekend of fun and skateboarding the legendary Maryhill Loops Road. Free-4-All is just as it sounds, anything goes. This event is open to all skill levels and any gravity powered vehicle is welcome. Do you like riding in large packs? Then the Free-4-All’s are for you! The pack riding at a Free-4-All is legendary so come and be a part of some of the largest packs anywhere in North America, an…d quite possibly the world. We will have Zealous Bearings outlaw race on Saturday with $100 cash to the winner. We willalso have the Ratz dash for cash, can you beat a Rat and win $100? The Raz want to thank Danialo for the awesome artwork!